Gadgets & Gizmos Discussion on the latest "toys" to enhance the adventure. I've been searching through gear, saw this and had to share. Warbonnet is the brand name. They have some really cool hammocks as well. Sounds like a lawnmower, Rides like a paint shaker! I got 99 problems but fuel injection, 6th gear or a 2nd cylinder ain't 1! My wife: "I didn't know if that was you coming home, or a neighbor mowing"
I picked up a warbonnet superfly tarp last season to add to the kit so that rainy days are less miserable at camp. They make some really nice stuff. Hammock Camping is really becoming a big thing that I've noticed around the Southeast. I go to a lot of different kinds of events requiring camping and I just keep seeing more and more of them. They seemed to become more prevalent at paddle/fishing events around the state. More and more I'm seeing them pop up at the motorcycle events. I like to sleep outdoors, but I do not like to sleep on the ground and actually have an old enclosed utility trailer that I turned into a toy hauler/camper. I'm not sure how my back would like one, but I've been seriously thinking about a hammock for some time. I was really intrigued as some of the places I'd like to camp are sparse in trees. Using one line off the bike is a cool concept (I do have a center stand). I really don't want to sleep on the ground without a tent as snakes love to cuddle. They seemed to become more prevalent at paddle/fishing events around the state. Funny, I attend paddle events too, but I have a truck camper and 20' box trailer. I haven't had the chance to do any type of motorcycle camping to date...the wife wants to trailer the bike behind the truck camper, and use it to base out of. We'll probably end up doing both, dependent on the destination. She has a point though. By the time I get the gear loaded, I can't see a lot of real estate left for a passenger. I was at an event this past weekend and the guy right next to me had a cool hammock set up. Check the link below for a photo. 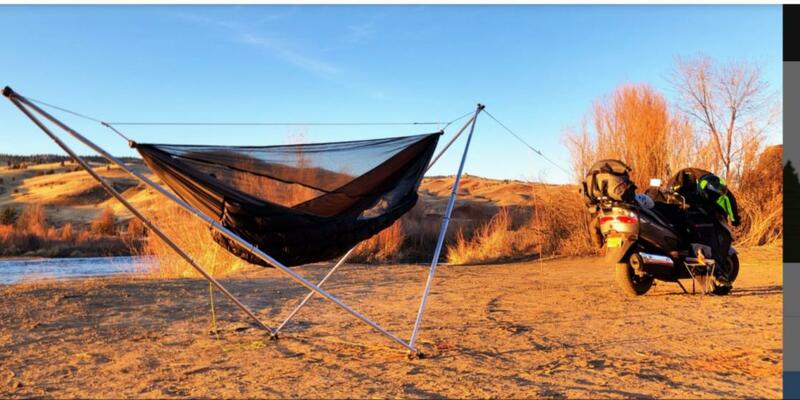 Seems like many of the hammock set ups at the paddle events are large structurally, bulky, maybe hard to transport. This one was small compact and looked really warm...although it didn't get below 60 degrees either night. Just a heads up with hammocks. National Parks will not let you tie them to trees, tables, and so on. Most state and some private campgrounds are the same. You will definitely need the hammock stand. Check before you go if you don't have a stand. Oh, well that's good to know.